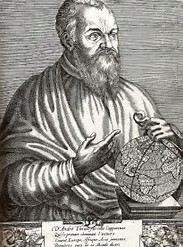 The Franciscan André Thevet (1502-1590) traveled widely through the Americas, folding observations from his own trips into accounts from other explorers to become a leading authority about the New World. His publications include Les Vrais Pourtraits et Vies des Hommes Illustres Grecz, Latins et Payens (1575), Singularitez de la France Antartique (1557) and Cosmographie de Levant (1554), richly-illustrated works that could be compared to modern-day encyclopedias with illustrations. The words and illustrations helped convey ideas of the New World to Europe, igniting the reader’s imagination. His Florida describes the colorful flowers, making perhaps the earliest suggestion that the state was named for its plant life (rather than discovery during Easter season) and marvels over the abundance of natural wealth in the form of pearls. 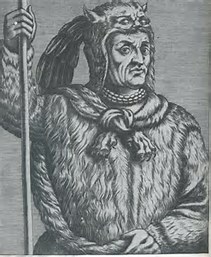 In Les Vrais Pourtraits et Vies des Hommes Illustres Grecz, Latins et Payens, Thevet chronicles the story of the King of Florida, Paraousti Satouriona. The 1568 English translation of The New Found Worlde or Antarctike, excerpted below, provides a window into how Europeans imagined the Spanish-claimed territory. The reader is invited to see the “wonderful and strange things” that Thevet has compiled, including an early description of the buffalo. It is important to note that Thevet never claims stepping foot on “terra Florida”; his ship reportedly sailed past. This glancing familiarity does not stop the author from suggesting to readers possible riches that await. [University of Virginia Library]. “André Thevet.” The Renaissance in Print: Sixteenth-Century Books in the Douglas Gordon Collection (2003). Schlesinger, Roger and Arthur P. Stabler (eds.). André Thevet’s North America: A Sixteenth Century View. Kingstone, Ont. : McGill-Queen’s UP, 1986. André Thevet. The New found worlde, or Antarctike, wherein is contained woderful and strange things, as well of humaine creatures, Beastes, Fishes, Foules, and Serpents, Trees, Plants, Mines of Golde and Siluer: garnished with many learned authorities, travailed and written in French tong by that excellent learned man, master Andrewe Thevet. And now newly translated into English wherein is reformed the errours of the ancient Cosmographers. London: by Henrie Bynneman for Thomas Hacket, 1568. Doubt not gentle Reader, but that the description of this present historie wil make thee to wonder, as wel bicause of the varietie of things that herein thou mayst reade, as also of many others whiche at the first wil seme unto thee rather monstrous than naturall. But after thou hast soberly wayed and considered the great effects of mother dame nature, I doe surely beleve and such admiratios shal haue no more place in thee. Also let it not seme to thee strage the setting forth of many strage trees as Palme trees and others, with beasts of the fielde and foules of the Ayre, the which are cleane contrarie to the setting forth of our Cosmographers and Anciente writers, who for bicause that they haue not seen the places, and for the small experience and knowledge that they had, did greatly erre. But if thou herein stande in doubt, then those that have travelled thether, and those Indians that were brought fro thence, can affirme all things herein contayned to be true. Furthermore if that there be here in this booke any wordes that seme to thee rude or il placed, thou shalt therefore accuse the fever and death (& fever) which hath so kept as cleaued to the Author since his return home, that he had no leasure to peruse his boke before that it came to the Printer, being prouoked to deliuer it at the commandement of the Cardinall of Sens: and death which happened to Ambrose de la Porte, a good student and well sene in the Frenche tong, who had taken upon him the whole charge of this present boke. Notwithstanding gentle Readers, our good will herein hath not bene wanting, onely wishing for recompence that it may be agreeable to thee, Farewell. Seeing that in writing this discourse we have made mention of this lande called Florida, although that in our retorne we approched not so neare, considering that our course lay not altogether so low, neverthelesse, we sayled close by to take an easterly wynde, It seemeth to me not out of the way, to write thereof some thing. Lykewise of the land of Canada that is next to it toward & north, being onely certaine montaines betwene bothe. Therefore keping our course of the height of new Spaine, on & right hande to attaine to Europe, not so sone non so right a course as we wished to have gone, we found the sea favorable ynough, but as by chaunce I put out my head for to beholde it. I saw as farre as I could extend my sight, all covered with herbs and flouers, the which gave my occasion to think that we were nere to the land, considering also & in places of the sea I had not so much seene, notwithstanding I found myselfe incontinently frustrate of my opinion, knowing that they proceded or the Sea, so & we saw the sea strawed with those hearbs for a space of 20 days. The sea in & part hath imal stonge of fish those places seeme rather to be marishes, than otherwise. Shortly after appeared another signe and for the wing of a starre with long tayle from the east into the north, the which for the wings, I leave to the iudgement of the Astronomers and to the experience of those that have knowledge therein. After this which was worse, we were troubled with a contrary wind, the terme of nyne days, even to the heigth of our Florida. That place is a poynt of lande entering into the full sea a hundred leagues, being 25 leagues a shelf or shallow 25 degrees and a half on this syde the syne & a hundreth leagues from the Caape of Baxa. Therefore this great land of Florida is very dangerous for those that sayle the coast of Catata, Camibalu, Panuca and Thenistitan: for to sight a farre of, it would be imaged an iland lying out in the mayn sea. Furthermore this place is dangerous bicause of the running waters, wyndes, and tempests that are in that coast commonly. As touching the mayn land of Florida, it hath on the east syde the province of Chicoma, and the ilands named Bahama and Lucaia. On the west syde lyeth Nova Espania, the which divideth the land that is named Anahac, of the which we have before shewed. The best and most fruitfullest countries that are Florida and Panuac, the which bordereth Nova Espania. The people of the countrey are naturally cruell and mightie men, being all idolaters, who when that they have neede either of water or sunne, for their gardens and roots, with which they dayly live, then they will fall downe before their idolls that are made to the similitude of men or of beastes. Besides this these people are more and better practiced in the feats of warre than the people of Perou. When they go to the warre, they beare their king on foure mens shoulders in a beastes skinne and they that beare him are clad and garnished with riche feathers. And when that they come to hande strokes, they set their king in the middest of them, clad with fine skinnes, and he will never depart from thence, until the battell be ended: Also if that they feele themselves to bee the weaker fort, and that their kyng beginneth to flee they wyll not fayle to kill hym, the which order the Persians and other barbarious nations in the East parte observe at this day: their weapons of defence are bowes and arrowes made of wood envenomed, the which in these of iron heades garnished at the ende with bones of fishes or wilde beasts, the whiche is very sharpe. Some of them eate their enimies, as the Americans will doe, of whom we have spoken. An although this people as we have before shewed are idolaters, nevertheless, they believe the soule to be immortall. Also that there is a place appointed for the wicked, the whiche is a very colde land, and that the Gods permit the sinnes of the wicked shall be punished. Also they beleve, that there is an infinite numbre of people in the skies and as many under the earth with many other folies, the which may be compared to the transformations of the Ovide, than to any other thyng. Furthermore, they beleve these things to be true, as Turkes and Arabians do that which is writen in their Alcoran. This countrey towarde the sea is not verie fruitfull, the people are very rusticall more than those of Perou or of America, for that they are traded wyth strangers. This lande was named Florida, in the yere 1512, by those that first did discover it: for bicause that by the seaside it was flourishing with greene trees and with an infinite number of flouers and divers & sundry colours. Betwene this Florida and the river of Palme are to be seene divers kinds of monstrous and strange beasts, among which there is a kind of great bulles having hornes a foot long, and on the backe a croupe like a camell, the heare long all about the bodie having a dunnish color. Of these beastes there were once two that were broughte quicke into Spayne, of one of the which I saw the skin, and not otherwise, and they lived there but a short time. This beast (as it is said) is perpetual enimie to the wolfe, it cannot abide him to be by him. In Florida toward the Caape of Baxe, there are certaine litle rivers, where the wyld men gather oisters, that have pearles. Now seing that we are come to the gathering of oysters, I will not forget by what meanes they get out these pearles, as wel in the east Indians. As in the West ye must note that every chiefe or head householder, having a greate number of slaves, knowing not to what labour to set them about they sende them to gather oysters, of the which they gather baskets full for their masters, putting them into certain great vessells, which being halfe full of water, is an occasion, that they oysters beyng conserved there in certaine dayes do open, and the water clensing them leaveth these stones or pearles with these vessells. And to get them out they first take the oisters out of the vessell, and then they lette the water oute by a hole, under the which they lay a linnen cloth, least that with the water the stones or pearles that mighte be, should runne out. As touching the figure of these oysters they differ much from ours, as well in colour as in shell, having each of them certain little holes, which would be thought to have been made artificially, in the which holes are these pearles. Thus muche thought I good to speake of by the way, the like also found at Perou, and certaine other stones in good number: but the finest are founde in the river of Palme, and in the river of Panuco, the which are distant the one from the other 32 leagues, but the chieftains have not libertie to get them bicause that the wilde men of that countrie, are not yet converted to our Christian faith. Now therefore coasting Florida on the left hand, the winde beyng to us contrary, we sayled very neere to Canada, and to another countrey that is called Baccalos, which was against our wills, and to our great displeasure, bicause of the extreme colde that molested us the terme of eightene dayes, although that this lad of Baccalos entreth farre into the full sea in forme of a point welnigh two hundreth leagues on the north side distant from the line onely fortie eight degrees. Thys pointe was named Baccales, bicause of a certaine fishe that is found thereabout in the sea, whiche they name Baccales, betwene which and the Cape Delgado, there is divers ilands peopled, very dangerous to avoid bicause of the multitude of rocks that compase the sayd iland & they are called the Ilands of Cortes. Some iudge them not to be islands but mayn lande, hangyng upon the point of Baccalles. These places were first discovered by an Englishman, Sebastian Babat, who informed Kyng Henry the Seventh that by that waye he would sayle into the country of Catia, towards the Northe, and that by this meanes he woulde fynde spices and other thyngs as well as the kyng of Portugal dyd in the east Indies: Neverthelesse his mynd was to go to Perou & America, for to people that cuntrie with Englishme, but his purpose toke no effect. True it is & he landed toward the coast of Irelad in the north 300 miles whereas bicause of the extreme colde the most part of his men dyed, thoughe it were in the moneth of July. And since Iames Quartier a Briton made thither two voyages, as he hymselfe shewed me in the yeare 1530 and 1535.